22 July 2017 – The United States withstood its toughest test of the tournament, defeating Canada 10-5 in the gold medal game of the FIL Rathbones Women’s World Cup on a rainy Saturday afternoon at Surrey Sports Park in Guildford, England. The U.S. improved to 60-6-1 all-time in World Cup competition and clinched its eighth World Cup title. Photo by Aby Kerry. The International Federation of Women’s Lacrosse Associations (IFWLA) was formed in 1972 to promote and develop the game of women’s lacrosse throughout the world. Inaugural members were Australia, England, Scotland, Wales and the United States. The number of member countries has grown rapidly as lacrosse popularity has spread. The IFWLA World Cup started in 1982 as an international lacrosse tournament that is held every four years, except in 1989 when it had only been three years since the 1986 IFWLA World Championship. The first World Cup was hosted in Nottingham, England. The United States team has won every World Cup except 1986 and 2005 where it finished second behind Australia. In 2007 the IFWLA merged with their men’s lacrosse counterpart, the International Lacrosse Federation (ILF), to form the Federation of International Lacrosse (FIL) – the current governing body of international lacrosse championships. In the latest event, Team USA made it three straight gold medals and eight overall when it defeated Canada 10-5 at the 2017 FIL Rathbones Women’s Lacrosse World Cup in Guildford, England. 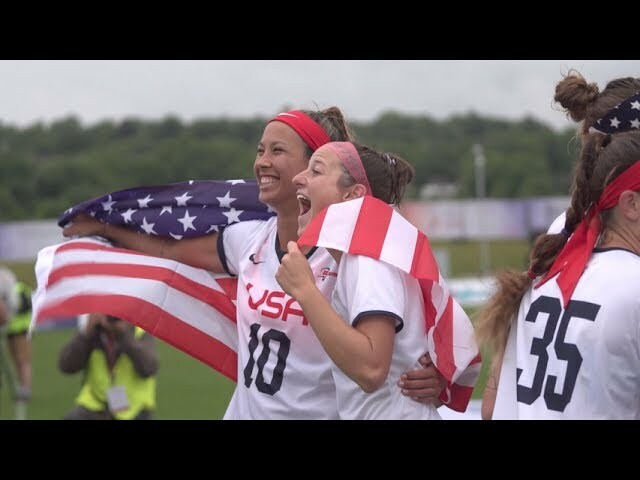 The 2021 FIL Women’s Lacrosse World Championship will be held in Towson, Maryland, United States at Towson University. ¹ Sudden victory overtime (first goal scored in overtime is the game winner). ² In 1982, the first ever International Federation of Women's Lacrosse Associations (IFWLA) championship took place in England with the USA defeating Australia in extra time (three additional minutes each way/straight change of ends. If after extra time the score is still tied, then three-minute halves are played on sudden victory basis [fist goal wins]). Click on image to open in lightbox. © 2015 FIL – Canada (7-1) held off a United States rally to win its first FIL U19 Women’s World Lacrosse Championship gold medal. The USA (7-1) earned its second silver medal after winning four straight golds in 1999, 2003, ’07 and ’11. Photo by David May via DEphoto. The International Federation of Women’s Lacrosse Associations (IFWLA) held its first U-19 World Championship in 1995. Australia defeated the United States 5-4 in Haverford, Pennsylvania. The U.S. then beat Australia in four straight finals since then. In 1999, the U.S. defeated the Aussies 15-8 on their home turf in Perth. They doubled-up on Australia in 2003, this time winning the championship 21-8 in Baltimore, Maryland. The U.S. women made it three straight golds in 2007 by defeating Australia 18-3 in Peterborough, Canada. The U.S. won its fourth gold in a row in 2011 in Hannover, Germany edging their Aussie rivals 14-12. Canada Golden, U.S. settles for Silver. After losing to the U.S. in the first game of pool play, Canada won seven straight games — including an impressive 17-3 win over Australia in the Semifinals, and a 9-8 victory over the U.S. to win the Gold. England wins historic bronze. England built a 9-3 lead early in the second before the Aussies roared back with a furious 6-1 rally to bring it to within one goal, 10-9, with 1:30 left. England held the Aussies scoreless through the final minute and thirty to preserve a 10-9 win for the bronze. Australia does not medal. For the first time in the history of the tournament, Australia did not play for the gold and finished out of the medals in fourth place after being upset by England in the bronze medal game. New Zealand finishes in 5th. The Kiwis surprised everyone with a 10-8 victory over Japan for 5th place. Previous finishes for New Zealand were 10th in 2007 and 11th in 2011. The host nation and location for the 2019 Women’s U19 Championship event will be determined in late 2015.